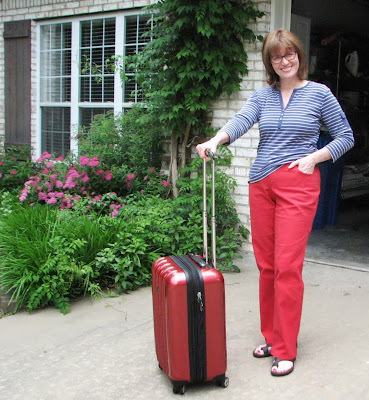 Madame Sew-and-Sew: Love my red jeans! My red jeans were a ton of fun. 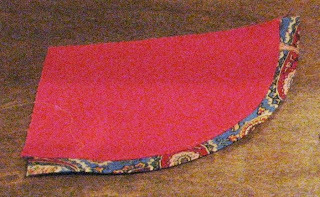 I initially thought that all that red would be too wild for pants, but after toying with the idea of sewing pedal pushers or shorts instead, I decided to sew them long anyway, if for nothing else but to experiment with the pattern. I also comforted myself with the fact that I do live in Razorback Country, so red pants are probably always socially acceptable here. As a reminder, I "cloned" a very comfortable pair of RTW pants. The RTW aren't jeans, they're Jones New York dress slacks in a slightly stretchy RPL that looks like wool. I love them so much, I'm afraid I will wear them out, so I want to make a few extra pairs for myself. I was a little concerned about how denim would fare with this pattern -- even if it is stretch denim -- but it's been fine. Draft of pants front pattern - pockets added. My dress pants do not have pockets, which I find rather annoying, so I added them to my pattern. Because pockets that pop out can also be annoying, I utilized the pocket stay method, where the pocket runs from the outside seam to the fly. 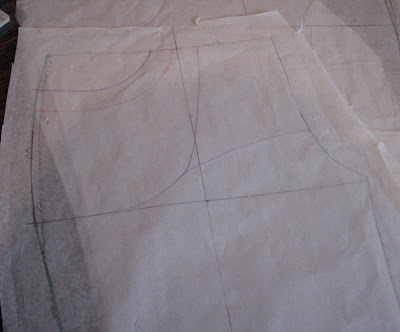 In order to help contain the stretch along the bias (thus utilizing my pocket stays as a built-in girdle), I stitched two semi-circles that roughly follow the bias of the inside pocket piece. That's in addition to cutting them so the lengthwise grain runs crosswise, which reduces the capacity to stretch a bit more. Next time I should probably just use power net! 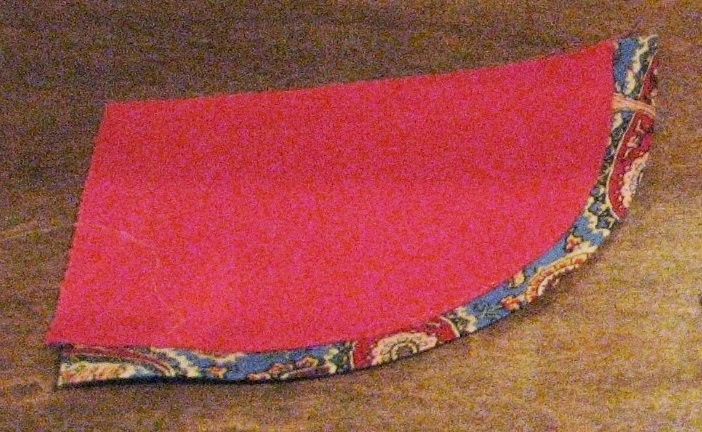 I picked up some really fun, multi-color paisley quilter's cotton in coordinating shades to use for pockets, waistband facing, bias tape and bias hem facing (since they weren't quite long enough for even a 1/2" hem). The coordinating cotton is what has made this project so enjoyable. 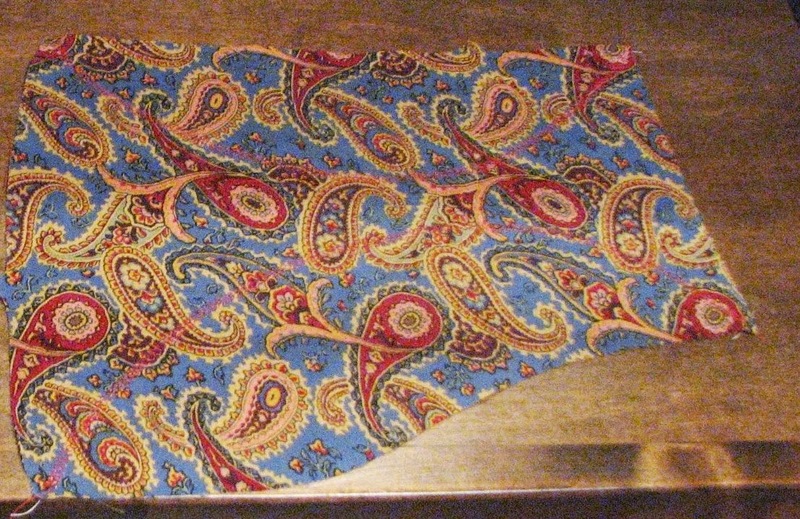 I'm not normally a paisley fan, but it really works with this crazy denim. The red center of the "amoeba" matches my red perfectly. 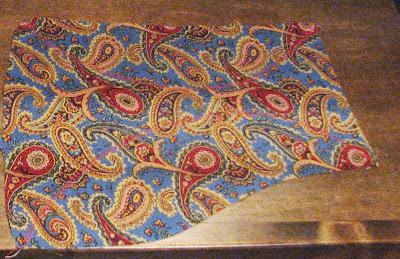 I found as many uses as possible for the paisley. I finished them Saturday morning and wore them the rest of the day to run errands. The only thing I would change is to reduce the ease a bit, since the denim has a tiny bit of stretch. They are really comfy and I am surprisingly not self-conscious about gallivanting around in bright coral-red pants. The pattern is a keeper, too.